I found this recipe from Chef In Training via Pinterest. Not that I need another cheese cracker recipe in my life, but I have been craving Cheeze Crackers ala Marilyn. Cheapskate me, though, didn't want to spend the $2.99 on a jar of Kraft Old English processed cheese. 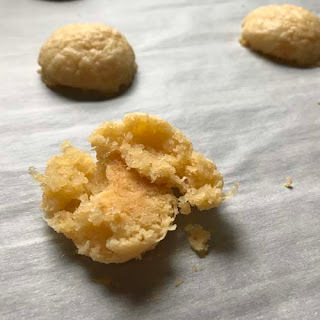 This recipe is great because it's basically my mom's cheese cracker recipe, but with real cheddar cheese, which costs about $2.50 less than the jar of Old English. Score. I made these gluten free because I am still attempting to limit my gluten. With all of the butter and cheese, though, you can't really tell the flour is not made with wheat. These tasty little treats are salty, cheesy, warm, and absolutely satisfying. The dough freezes perfectly for baking up just a few at a time, or if you just want to plan ahead. Preheat oven to 375 degrees Fahrenheit, and line a baking sheet with parchment paper. Get out your food processor and put in the grater attachment. Grate the cheese and the butter. Transfer the grated cheese and butter to a medium mixing bowl and then replace the grater attachment in your food processor to the blade attachment. 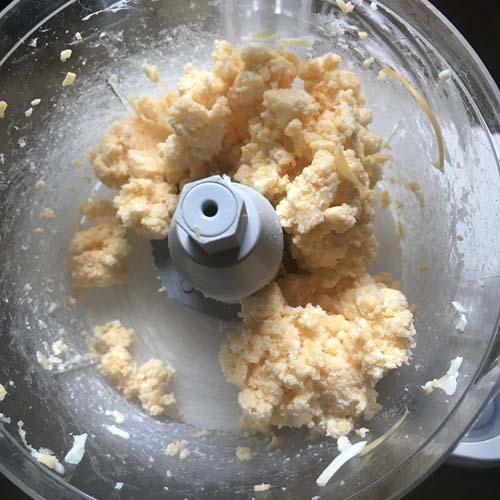 Add the grated butter and cheese back into the food processor (fitted with the blade now). Mix until the butter and cheese are completely incorporated. Add the flour and salt. Mix until a dough forms and creates a cohesive ball (or other solid shape--mine looked like a fat sausage). 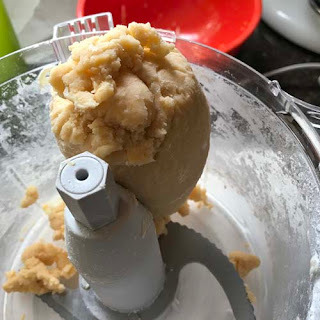 Transfer dough to the bowl you used for the butter and cheese earlier. 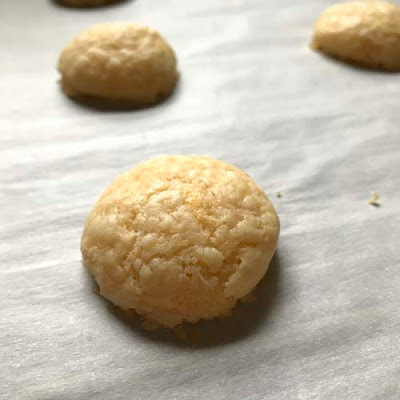 Scoop about two teaspoons of dough out and roll into a ball. 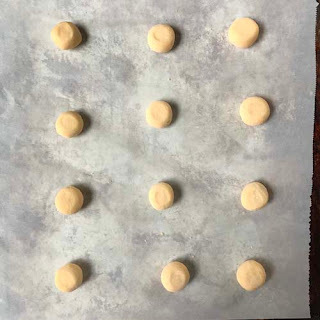 Place ball on prepared baking sheet and gently press on the top, just enough so that the ball won't roll off the pan. 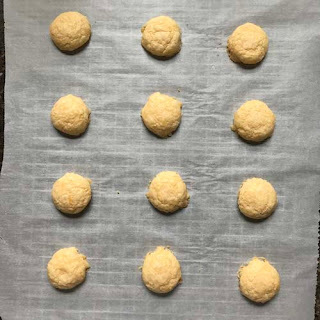 Place additional balls onto the pan, leaving about 1 1/2 to 2 inches between balls of dough. Bake at 375 degrees for about 9-10 minutes, or until puffed and possibly browning on the edges just slightly. Remove from oven and allow to cool for 3-5 minutes. Remove to a serving plate and enjoy, taking care not to burn yourself. Continue to roll and bake the remaining dough. * If you would like to freeze some to bake off later, line with wax paper a small pan that will fit into your freezer. Form the balls and press to keep from rolling. 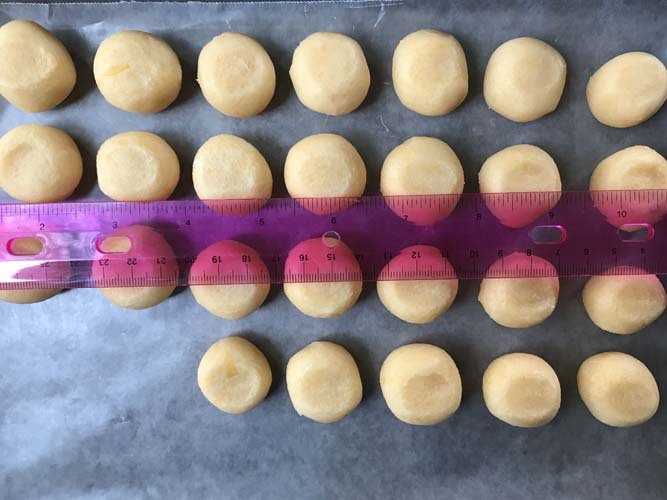 Freeze formed balls until firm and then transfer to a zip top freezer bag. 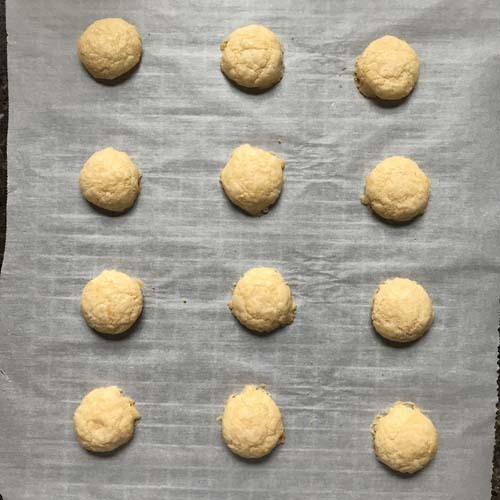 When ready to bake, put the dough balls on the pan while the oven preheats, and bake as directed above. 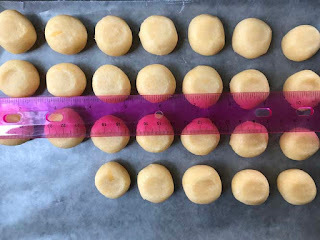 Dough balls formed for freezing -- each is about 1 1/2 cm in diameter.